When we built our house about 10 years ago, the neighborhood was new and there were no fences. We had a patio in back, and although we consider ourselves to be social people, we felt conspicuously conspicuous while sitting out enjoying the evening……. and everyone else’s evening as well! We decided to construct a semi-private fence about 4 feet out from the patio on two sides. We left 5-6 feet of open space in the adjacent corners so there is a walkway to the yard without walking all around either side of the fence. I just love it! 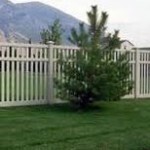 It’s just 2, 6-ft sections of vinyl fence to the south and 2, 6-ft sections of vinyl fence to the west. It is “semi”-private so it has a 2” slat, space, then a 3” slat, repeat. We can still see what’s going on in the rest of our yard and enjoy the birds as well. It’s all we needed to give us the “feeling” of privacy we wanted in the first few years, and now a cozy room to always enjoy. And even though we now have a fence enclosing the yard, this privacy fence gives our patio its own sense of space, a secluded-ness and coziness that I did not expect. It created an adorable outdoor “room” where we enjoy the good company of family and friends and homemade lemonade. It’s fabulous! 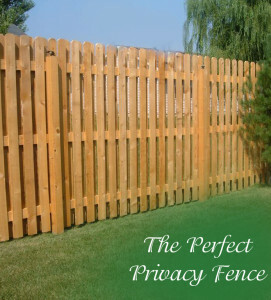 By the way, this fence would look so great done with that TREX stuff…even warmer and cozier! You need a Pinterest button!